Today marks the day "K9 veterans" are acknowledged for their vital services in our communities. Young children are often quite aware of the working dogs they see or discover anecdotally. For librarians and teachers, the challenge is providing interesting, age-appropriate, factually solid books on the topic. Enslow Publishers "Amazing Working Dogs with American Humane" addresses that need with on-target titles about these heroic canines. Author Linda Bozzo's six-title series introduces young readers to various service dogs through high-interest topics. Each 48-page book includes attractive full-color photos that provide visual reinforcement of the well-written text. Useful back matter, such as a glossary, a further reading list, and Internet addresses, are available for each title. Librarians, teachers, and parents can also feel assured about the books, as they were done with the approval of the American Humane Association. Each title in the "Amazing Working Dogs with American Humane" is available in a library-bound edition for $17.95 when ordered directly from Enslow Publishers. That price, available to school and public library purchasers, represents a 25% discount from Enslow's list price. This week is National Fire Prevention Week, and I would like to take a moment to recognize the often unsung heroes of fire prevention: the hard-working Fire Dog Heroes. Aside from keeping up morale at their fire department stations, most of us do not really know what fire dogs actually do. When we imagine a fire dog, we picture a Dalmatian living at a fire department station and riding in the fire engine. While a few fire departments do keep Dalmatians around, they are relatively rare a fire stations today. When fire departments relied on horse-driven steam pumpers instead of fire engines, dalmatians lived and traveled with the horses in order to keep them calm. Though horses and steam pumpers are no longer used by firemen, fire dogs are still very important. Today's fire dogs are brought in shortly after a fire to sniff for accelerants (typically gasoline or any other flammable chemical) that may have fueled the fire. If a fire dog detects an accelerant, it will signal to its handler to take a sample to test for accelerants By detecting these accelerants, fire dogs are able to help a fire department determine if a fire was unintentional or the result of arson. Instead of Dalmatians, today's fire dogs are most often Labrador mixes, golden retrievers, golden mixes, and German shepherds. These breeds make great fire dogs because they like to work and they are capable of detecting very faint scents. 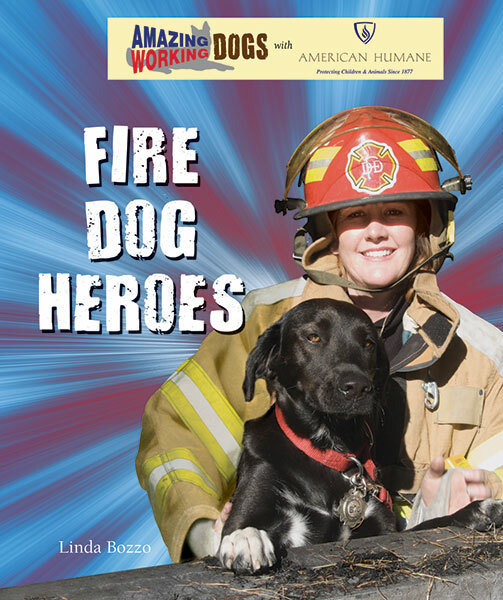 If you have kids or teach any children that want to learn more about fire dogs, check out Fire Dog Heroes, from our Amazing Working Dogs with American Humane series by Linda Bozzo. Author Linda Bozzo, who has written a number of well-received series for Enslow Publishers, will be presenting at this year's New Jersey Association of School Librarians (NJASL) convention. Her presentation -- The Art of Writing for Children --is scheduled to be held on Friday, December 3rd, 7:45 am, in the Ocean Place Resort and Spa's McKinley Room. Bozzo will also be signing copies of her books on Friday, starting at 10:30 am, at the Authors and Illustrators Alley. Her most recent Enslow series are Amazing Working Dogs with American Humane and Imagining the Future. Did you know: working guide dogs are allowed to enter all public places but puppies-in-training are not? The next time you see one of these dogs with their special harnesses, you know they are working. A great tie-in to Blind Awareness Month is Enslow's new Guide Dog Heroes, written by Linda Bozzo. This 48 page book is written for grades 3-4 and is part of the Amazing Working Dogs with American Humane series. Enslow is planning on publishing two titles on blindness-related subjects in the Fall of 2011. Watch for them! Enslow author, Linda Bozzo, visited James Monroe Elementary School in Edison, New Jersey yesterday to present Officer Shawn Meade and his K-9 partner, Lucky, a copy of her new book Police Dog Heroes in which the officer and his dog are featured. After presenting the newly published book to Officer Meade, Linda read from the book. She also talked about how she came in contact with the officer and told the group of children how he helped her with the research for the book. Police Dog Heroes is one of six books in Enslow's new series, "Amazing Working Dogs with American Humane" for grades 3–4. Each book in the series features a true story of a real dog and his handler as well as includes the history, breeds used, training, the work they do, and what happens when these dog heroes retire.